For First Look Media's midtown Manhattan headquarters, we transformed two floors of a landmark 1910 building into an essential and adaptable office designed to facilitate the delicate balance between individual focus and team collaboration at the heart of the modern workplace. First Look Media's founder tasked us with giving the office the feel of an artist's studio, where the space itself supports the creative and collaborative culture of the workplace. This sense of dynamic connectivity is further embodied by a sculptural raw steel staircase built to connect the two floors. A modular low-raised floor (concealing a flexible arrangement of power and data) anticipates myriad potential seating configurations within the open-plan space, while movable interior walls allow for conference rooms to be expanded or reconfigured. Seeming constraints—like stringent standards for healthy and sustainable materials and the building's small, snail-paced freight elevator—instead became constructive provocations, inspiring a commitment to deliberate, user-centered design decisions in lieu of aesthetic flourishes for their own sake. As with each word in a poem, each new element added to the space was carefully chosen. This sense of stripping away the unessential extends to the exterior walls and ceilings, where the building's original terra cotta masonry—revealed during demolition—is left exposed rather than being covered by an excess of drywall. While a series of glassy conference rooms offer sound privacy for sensitive conversations, the traditional cubicle-office hierarchy of a newsroom is eschewed in favor of an open plan. A heterotopia of editors, journalists, creatives, and operations staff share adjustable height studio-style desks on wheels that can be arranged in rows or clusters as teams of collaborators form and reshuffle. We harnessed invisible yet potent experiential factors—light, air, and sound—as design mediums, tuning the working environment for human comfort and optimized focus. 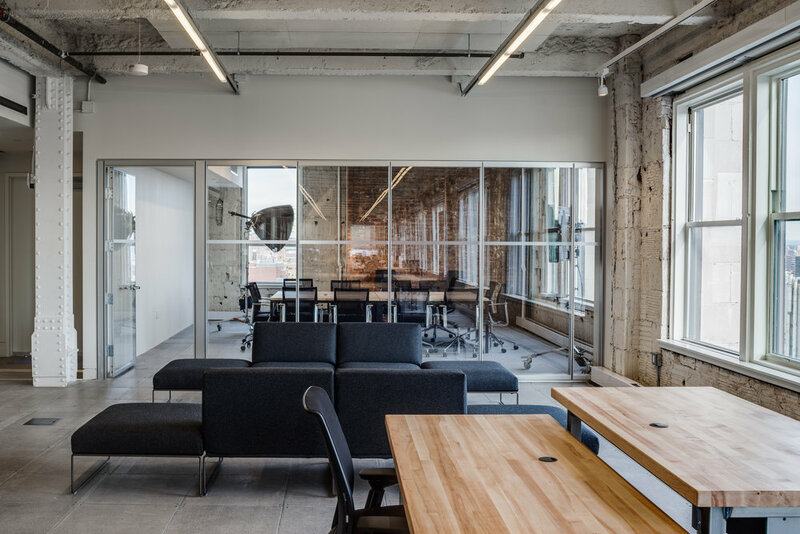 A sheer white lime-wash on the exposed terra cotta walls allows natural light to bounce throughout the space, eliminating glare while improving air quality by absorbing toxins. Sound masking enables speech privacy within meeting rooms without eliminating the pleasant ambient bustle of the newsroom. Perched high amongst the Midtown skyline, First Look’s offices are at once connected to, and set apart from, the street-level bustle of New York City. Once the space had been stripped of the trappings of its previous life as the offices of an upscale fashion brand—including dropped ceilings a perimeter of private offices—we chose to position the open-plan newsroom along the glassy northern face of the building, affording glare-free daylight and iconic views of Midtown and beyond. This decision points to our broader strategic approach to design that optimizes the occupant’s experience of light and endeavors to bring the outside (in this case, a dramatic urban skyline) into the building, as the newsroom’s clusters of adjustable-height desks mirror the rise and fall of the cityscape. Acoustical Consultant: Charles M. Salter Assoc. Inc.